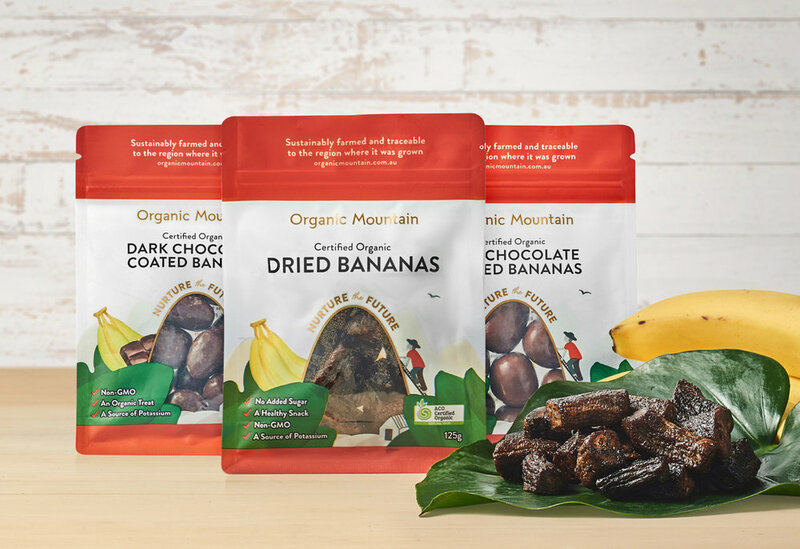 Organic Mountain is a 100% organic food brand that offers a range of beverages, snacks and pantry ingredients. They’re inspired by their ancestors, the Tayrona people of Colombia’s Sierra Nevada, the true pioneers of sustainable farming. Today Organic Mountain's mission remains the same – Respect the land and nurture a more sustainable future that will enrich us all. Squad Ink’s brief was to develop a well-positioned brand and packaging range targeting families seeking a healthier alternative to everyday grocery products. It was paramount that we tell the story of the lush peek of goodness they call the ‘Organic Mountain’ and the people of the land that have inspired a mission so deeply rooted in their business that it touches everyone that experiences it. Our packaging concept is centred around the ‘Organic Mountain’ from which all life flourishes from. We’ve developed this simple idea into a striking visual language that traverses a growing range of products from sweeteners and flours through to coffees and oils. For the flours, sweeteners and grains we opted for visibility of the product inside through the mountain shaped window. It allowed us to hero the mountain and create a connection to the land from which it was grown. It also offered shoppers full transparency of the product inside which was an important consideration in the design phase. For oils and coffee where product was already visible through the glass bottle or jar we used a solid gold foil on the mountain graphic, which allowed for it to radiate on the shelf and add premium quality cues. We also worked with the client to develop a tracking system that offers customers the ability to “Trace their Difference”. 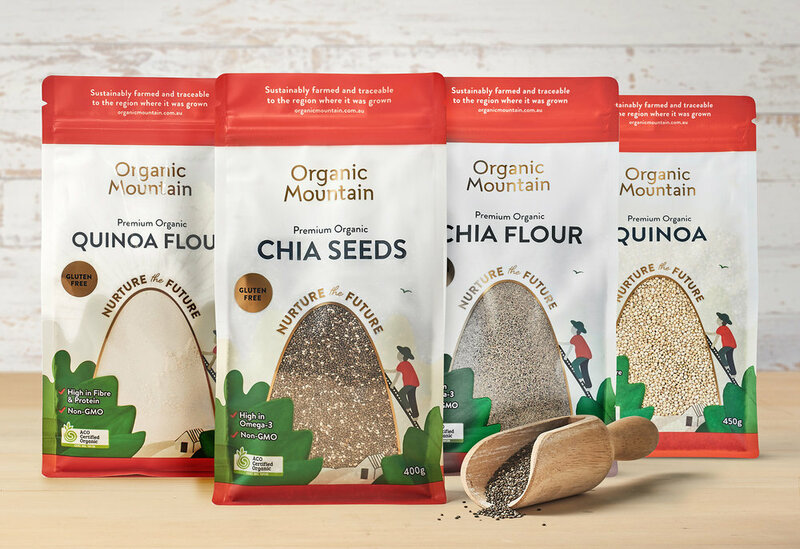 Every time you purchase an Organic Mountain product you are supporting one of Organic Mountain’s charitable initiatives that gives back to local farming communities. 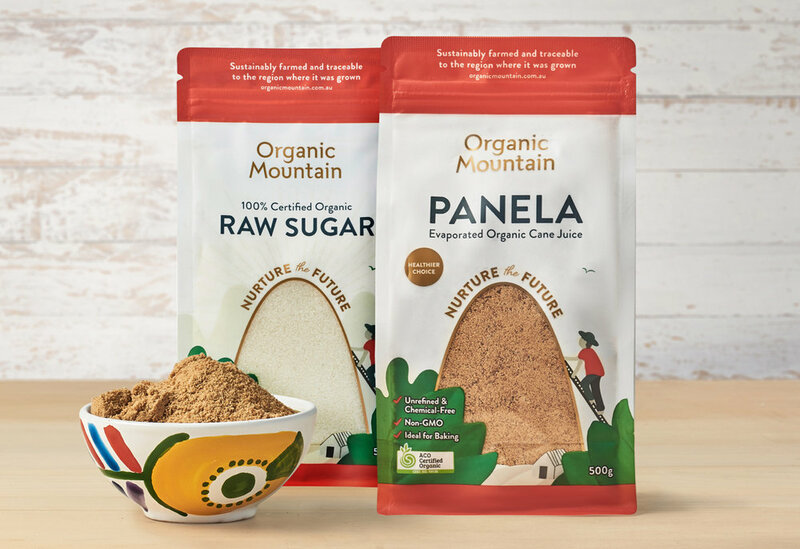 The success of the Organic Mountain product range lies within its ability to deliver a strong visual identity and communicate their compelling mission to build a sustainable future for all.